Despite reporting a dire need for medical equipment, the Hamas terror organisation turned back two shipments of medical supplies for their populace because the goods bore labels from the Israel Defence Forces. On Tuesday, Israel expedited deliveries of medical equipment into Gaza through the Kerem Shalom Crossing, which Israel had reopened a day earlier after Palestinians burned it on Friday. Four of the supply shipments were sent from the Palestinian Authority, two from the United Nations Children’s Fund, and two from the Israel Defence Forces’ Technological and Logistics Directorate. The IDF reported that its shipment included IV fluids, bandages, disinfectants, hospital gowns, pediatric supplies and fuel for hospital generators. Though the Hamas-run Gaza health ministry has been stressing the dire need for more medical supplies, Hamas refused to accept those from Israel, turning the two Israeli trucks around even after they had passed through the crossing. Hamas called Israel “the murderers of our people,” and said Israel was “trying to improve its black image” by sending humanitarian aid. Also on Tuesday, Hamas forbade 14 trucks laden with food and diapers from entering Gaza, only allowing in medical equipment. 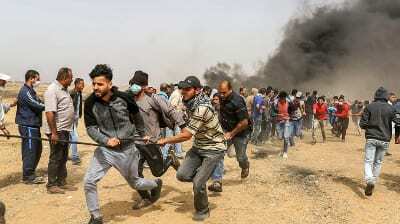 More than 60 Palestinians were killed, including at least 50 members of Hamas, when masses of people organized by the group attacked the Israeli border, shooting at IDF soldiers, throwing gas bombs and rocks, flying incendiary kites and trying to break through the fence into Israel. As many as 2,000 rioters were injured. The IDF called the riots “unprecedentedly violent,” saying they only used live fire as a last resort. Hamas also attempted to incriminate Israel by suggesting that IDF soldiers caused the death of an 8-month-old baby who inhaled tear gas, but a Gaza doctor told the Associated Press that the baby had a pre-existing medical condition that likely caused her death. Both sites I’m convinced of three things ..
And sentiments emanating from these social media platforms. ..and puppets … so be it. Until it’s running on empty.